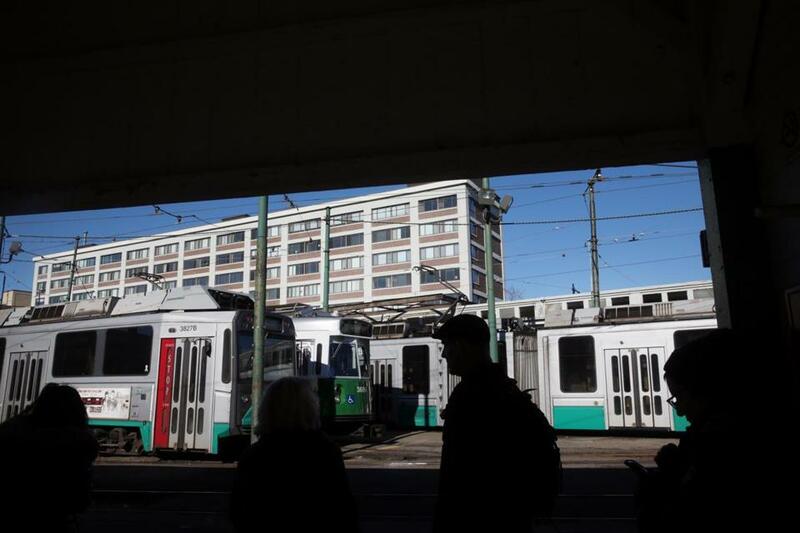 Commuters waited for a Green Line train at Lechmere Station in Cambridge on Friday. GLX Constructors, a joint venture of several engineering and construction firms, will design and build the Green Line extension. The MBTA has named the winning bidder for the agency’s largest-ever construction contract — the 4.7-mile extension of the Green Line through Somerville and Medford. GLX Constructors, a joint venture of several engineering and construction firms, will design and build the extension, which includes seven new stations from Lechmere in Cambridge to Tufts University. The company said it could build the expansion for $1.08 billion, well below a maximum price set by the T, and has promised to restore portions of the project that were previously cut, such as a key portion of a bike lane, additional elevators at stations, and an expansive vehicle maintenance facility in Somerville. “We could not have asked for a better outcome,” said John Dalton, the project manager overseeing the rail expansion. The award, which must be formally approved by the agency’s board later this month, marks a significant milestone for the long-planned and long-delayed rapid transit project that underwent substantial changes after ballooning costs threatened to kill it altogether in 2015. GLX Constructors was chosen from two finalists. It had the lower of the two bids, but price was not the only factor: The winner was chosen based on who offered the best value while staying under an agency-mandated limit of $1.3 billion. The agency used a scorecard to rate the quality of the bids, and bidders gained extra points if they restored certain features that were eliminated during an earlier round of cost-cutting, including canopies over the stations, public art, and a portion of a cycling and walking path along the tracks. GLX Constructors — which consists of Texas-based Fluor Enterprises, the Middlesex Corp., and other companies — included all of these optional components. Other major transit projects Fluor is involved with include Maryland’s Purple Line and a commuter line in Denver. Max Jordan, executive director of Fluor, spoke succinctly about why his group could afford to add the features back to the project. “The numbers worked out,” he said. Lynn Weissman, cochair of the Friends of the Community Path group that had lamented the path’s exclusion from the project, said she was “very pleasantly surprised” that the full path will now be built. Still, given the project’s turbulent history, she said she’s not celebrating yet. The other finalist for the contract was another joint venture called Green Line Partners. That consortium also said it could include all the added features, but at a higher cost. A third group, Walsh-Barletta-Granite JV, was eliminated earlier this year, when it said it couldn’t complete the project under the $1.3 billion limit. Construction could begin early next year, with service expected to begin in 2021. Some early work separate from this contract is already underway. This contract is the largest portion of the overall extension project, which the MBTA has estimated will cost $2.3 billion, and will include new Green Line trolleys, real estate purchases, and other related contracts. It also includes sunk costs from earlier work, before the Baker administration stalled the project two years ago as cost estimates for the extension rose to as high as $3 billion. The state eventually fired the prior contractors and revised portions of the project with more limited station designs and fewer amenities to get the cost to $2.3 billion. Earlier in the project, the T used an unfamiliar contracting format that allowed contractors to stretch cost estimates. The agency procured the work differently this time, which will prevent GLX Constructors from letting the costs grow despite the low bidding price, said Joseph Aiello, chairman of the T’s board. The long and winding history of the extension, expected to provide about 50,000 daily trips once completed, dates back decades. The project, already well overdue by prior scheduling estimates, is a legal requirement as environmental mitigation related to the Big Dig highway project. The federal government will pay about $1 billion of the project, with the state paying most of the rest. The cities of Somerville and Cambridge are also contributing, and they expect to recoup some of that money from real estate developers whose land will increase in value because of proximity to the new service. In a statement, Somerville Mayor Joseph Curtatone celebrated that “we have a commitment that the Green Line will come to Somerville, and with it the full construction of the community path extension that our community has fought long and hard for.” He thanked the Baker administration and community activists. In the more distant future, the T might send service farther into Medford, to Route 16, as an additional expansion of the project. But that project is separate from the first seven stations and is not currently funded. Instead, money that had been designated for the service to Route 16 was redirected to pay for the first part of the extension as its budget grew.